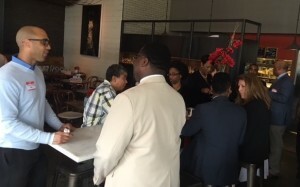 The Georgia Diversity Council held its 2016 Spring Mixer at Bellwoods Social House on April 14th. The purpose of the Mixer is to bring like-minded professionals together to network and learn more about the Georgia Diversity Council. Chapter leaders and members were present to welcome new people and provide more information about the National Diversity Council and its local Georgia initiatives. The Georgia Diversity Council would like to thank the event sponsors for their support of the Mixer: Comcast, NBCUniversal and The Home Depot. Special thanks to the Mixer attendees for participating! Photos from the Mixer can be found here.